I had to put my camera in the shop again. Who would have thought I’d have so many problems with a high end Nikon? Stupid problems really… the latest was the USB connection that I use to download thousands of pictures on a weekly basis became loose and failed to maintain the connection with my computer. The guy at the shop said I should never use the USB and that I should get a card reader. Really? That’s disappointing. In my search for a card reader, I found this neat little item, and while it’s not very new, I somehow had never heard of it. (Don’t ask me how that happened.) Check out a Sandisk SD card that is hinged, and folds down, revealing a USB adaptor, what a great idea! Now I can eliminate the USB cord all together and simply pop the card out of the camera and offload my pics right to my PC. 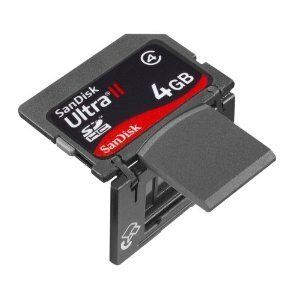 The Sandisk Ultra II is a relatively standard memory card that’s quite ample in its performance, featuring 15MB/sec Read/Write speeds and useful for almost any kind of photography. The Sandisk Ultra is also capable of some pretty solid transfer times between the card and your PC. The only downside I can find to this nifty little card is that 4 GB’s is the largest card they make, but with such easy data transfers, all without the pesky cords and wires, and with an under 25 dollar price tag for the 4 GB I guess I’ll just get a few of them. Available for your transferring pleasure at amazon.com. Did you guys already know about these? It’s okay, you can tell me. Novel idea, but hardly new! I had one of those years ago, but when I plugged it in to a USB port, it wouldn’t connect, so in the garbage it went! I had seen it was around for a while – somehow I missed it. The reviews were very positive, was your a Sandisk? There OLD ! why is this being posted… i have one from 3 years ago. Works great and its a Scandisk with a tiny blie flashing light…. Next you guys are going to review the Playstaion 2 and Toyota Hybrid. I had one at least 4 years ago, actually had a few of them because they stopped work right soon after buying them. I liked the conveniance of the case. I said it wasn’t new… I had never heard of them, which is unusual.. so I thought I’d mention them… seems there are still folks that didn’t know!!! they are great for plugging straight into the usb port on your TV to access photos/videos. These days with every laptop coming with an in built card reader, I would be surprised to see anyone who even unties the cable that comes with the camera to transfer pictures. There are cameras capable of uploading pictures directly via wifi. Also a 4GB card in a camera, well sure if you are covering a small party but I find my 32GB card too less when shooting in RAW. Oh wao… Sandisk has been doing great innovations since its launch. A very realistic and awesome device ever seen. Will surely love to buy this one. You mean you have a computer with a USB port and not any card reader slots…….must be old school.